Voluntourism, a word combining “volunteer” and “tourism”, is a phenomenon that has gained popularity in recent years, especially among high school students anxious to get something on their resumes to prove to prospective colleges that they are the epitome of compassion and ambassadors for cross-cultural communication. The difference between volunteering and voluntourism is that in voluntourism, a person pays to travel to a country, focusing on tourism and travel with a relatively small amount of volunteer work. However, this does not keep programs from advertising themselves as humanitarian programs, building the next generation while simultaneously helping less developed countries. I went on one of these trips the summer before my freshman year with a program that advertises itself as “a Peace Corps for teens”. I traveled to Chiang Mai, Thailand, for two weeks and lived in an elephant home. People were assigned in pairs and then each pair was assigned a place to bathe, feed, and read each day. Our “volunteer” work was teaching one class at the local elementary school and cutting some grass for our elephants to eat. I returned to the United States no more compassionate or cultured, but simply as someone who had spent two weeks with elephants. There is nothing wrong with that, except that the program advertises itself as humanitarian. In reality, the elephants we were riding probably grew up under threat of a bullhook, in conditions far from humane. Even programs who follow through with their promise of volunteer work can negatively affect their host country or countries. According to an article from Brandeis University, voluntourism almost always involves a group of “idealistic and privileged travelers” who live in socio-economic situations vastly different from those they are trying to help. This creates a power structure which can strain the intercultural relations a program claims to strengthen. Mark Watson, the Executive Director of Tourism Concern, a charity research in the ethics of tourism, tells World Travel Guide that voluntourism does not have a huge positive impact, relaying a story of a girl who travels to Tanzania to build a school. At nightfall, the local builders had to come and rebuild the walls of the school, because the voluntourists had not done so correctly. He believes that the voluntourism industry should be more exclusive; too many unskilled workers believe they have something to lend to a project. The idea of (predominantly) white Americans “going to Africa to help the Africans” is, to him and myself, extremely imperialistic. These programs also reinforce the stereotype of the host countries as “less than”, as poor countries filled with people who require Americans’ help. So, what does this mean? 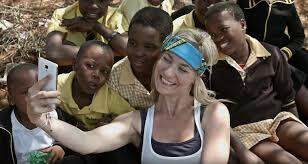 Should you never go on a voluntourism trip? Not necessarily. Organizations like Learning Service and People and Places ready volunteers with skills that can be useful to the host country, and they also assign people destinations based on skills they have already acquired. If you do decide to go on a voluntourism trip, or service trip, or anything else you label it, it’s essential that you do your research if you really want to make a difference. Find a program that carries through on its promises to provide humanitarian aid, instead of just going with the big programs, like Youthlinc or GLA. For most programs, the help you will lend to the host country will probably be the bare minimum: supporting the economy through any money you spend on your trip. Remember: being an entitled kid who can afford to go and help the “impoverished Africans” does not make you an ambassador.